﻿ Home | Epitope Biotech Inc. Welcome to Epitope Biotech Inc. The OEM manufacturer of high quality mouse monoclonal antibodies (mAbs) for specific epitopes. We offer the unparalleled combination of quality and price. After years on the global market and thousands of independent experimental trials later, our monoclonal antibodies have been shown to be the most sensitive and having the highest specificity when compared to similar products from other biotech firms. Our current products include tag antibodies, loading controls, and signal transduction antibodies. Please visit the Products page or use the Quick Links on the left for a complete listing and pricing of our mAbs. For a current list of vendors that carry our products, please visit the Vendors page. For OEM wholesale of our mAbs and bulk order discounts, please contact our Business Development Team at bd@epitopebio.ca. There are currently no promotional offers. Please check back soon! 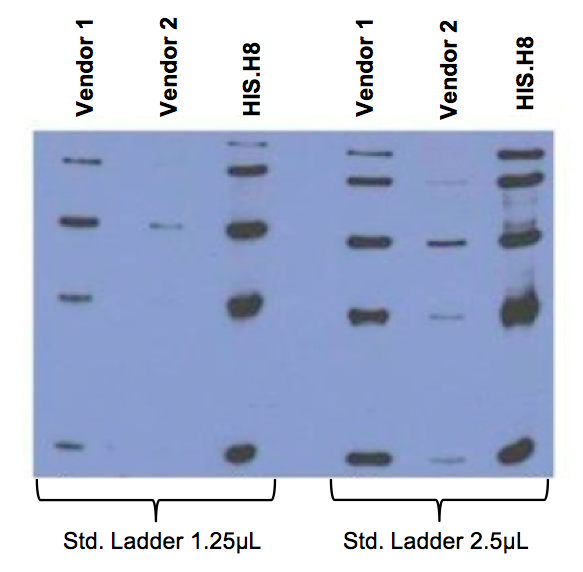 EBI's Anti-His Tag (HIS.H8) mAb is one of the most popular anti-His tag mAb on the global market. We estimate that thousands of labs around the world use it. Numerous successful papers published in top scientific journals serve to showcase the high sensitivity and high affinity of this mAb (see Literatures). EBI now offer an entire suite of commonly used loading control mAbs. 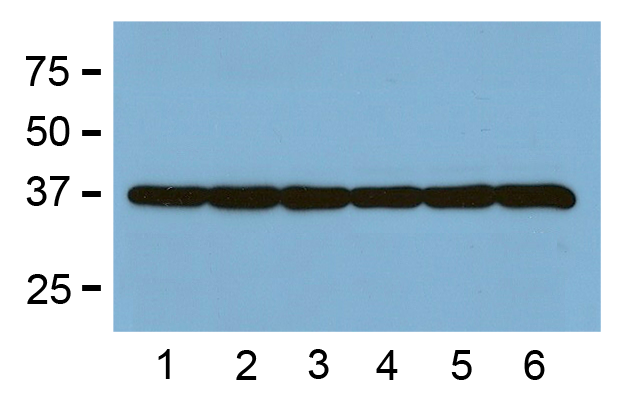 Here are the three loading control mAbs blotted against 10μg/lane of mouse brain tissue lysates. 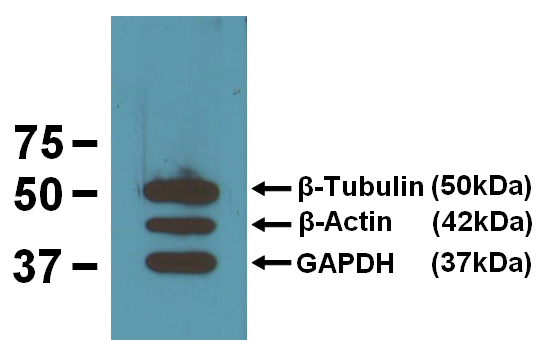 The 50kDa band is Anti-β-Tubulin (BT7R) at 1:2000 dilution (0.5μg/mL); the 42kDa band is Anti-β-Actin (BA3R) at 1:1000 dilution (1μg/mL); and the 37kDa band is Anti-GAPDH (GA1R) at 1:5000 dilution (0.2μg/mL). EBI's Anti-GAPDH (GA1R) loading control mAb is truly unique: it gives clear WB results at dilution ratios as high as 1:100,000. It is also the only GAPDH Ab on the market that recognizes the GAPDH protein from the following species: BL-21 bacteria, Sf9 insect, Saccharomyces cerevisiae (yeast), plus tissues from human, mouse, rat, rabbit, chicken, hamster, and potentially many more species. EBI's Anti-RFP Tag (RF5R) mAb has high affinity and is very versatile: it recognizes both the native and denatured forms of RFP and its many variants: TagRFP, TurboRFP, dsRed, mCherry, mOrange, tdTomato, etc. EBI's Anti-GFP Tag (GF28R) mAb also has high affinity and is equally versatile to its RFP counterpart: it recognizes both the native and denatured forms of GFP and its many variants: YFP, EGFP, EYFP, and CFP. EBI's Anti-ERK1 (E32, E19) signal transduction mAbs recognize only the ERK1 protein, but not the ERK2 protein. These mAbs have particularly high affinity, and are highly effective for immunoprecipitation applications.